It’s fair to say that CHITTY CHITTY BANG BANG holds a special place in most people’s hearts. Since 1968, the British musical has entertained audiences of all ages with its mixture of madness, intrigue and exuberance. Understandably then, expectations are high for the stage show which flies into Salford’s The Lowry for a 6 week run over Christmas. 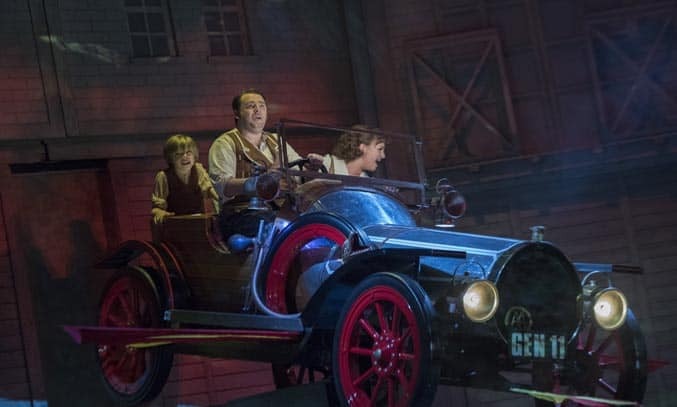 Based loosely on the novel by Ian Fleming, CHITTY CHITTY BANG BANG tells the story of eccentric inventor Caractacus Potts who is swept away on an extraordinary adventure with his two children and the beautiful Truly Scrumptious. But Truly and the Potts family soon find themselves in peril when the Baron and Baroness Bombast of Vulgaria plot to uncover the secrets of their magical flying machine, the former Grand Prix-winning racing car, Chitty Chitty Bang Bang. Entertaining, funny and visually spectacular, director James Brining does an impressive job of breathing new life into Fleming’s classic tale by using video projection and new musical arrangements of the Sherman brothers’ iconic score, to give the musical a fresh, contemporary feel. From Simon Higlett’s clever storybook set design to Stephen Mear’s rich and varied choreography, every inch of this production entertains and delights. The success of any show lies in the strength of the cast and CHITTY CHITTY BANG BANG doesn’t disappoint. Jason Manford (THE PRODUCERS, SWEENEY TODD) is an instantly likeable as madcap inventor and widower Caractacus Potts, playing the role with warmth and humour. Charlotte Wakefield brings just the right amount of feistiness, charm and humour to the role of Truly Scrumptious, while Henry Kent and Lucy Sherman delight as The Potts children, Jeremy and Jemima, delivering a confident and engaging performance. 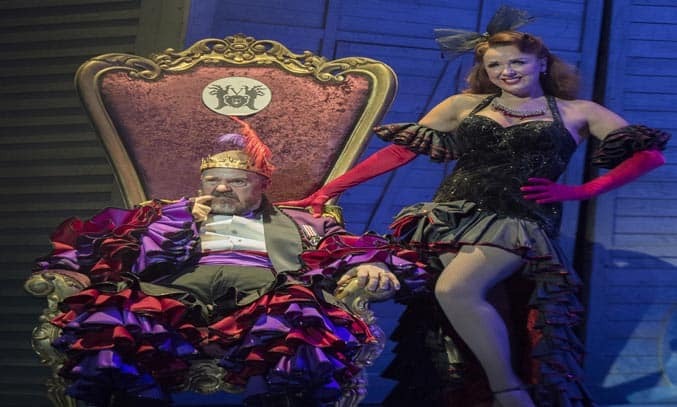 Phil Jupitus and Clare Sweeney work well together as the evil Baron and Baroness of Vulgaria, although there are times when Jupitus could bring a little more energy to the role. As bad guys go however, the Bomhursts are completely overshadowed by Sam Harrison and Scott Paige as spies Vulgarian Boris and Goran, and Jos Vantyler as the sinister Childcatcher, with Vantyler in particularly sending a shiver down the spine with his high pitched laugh and creepy cry of ‘lollipops’ and ‘cherry pie’. But the real star of the show, of course, Chitty Chitty Bang Bang itself. The car soars above the stage, smoothly gliding up and down and tilting forwards to give the audience an excellent sense of perspective. It is here where Simon Wainwright’s fantastic video design really comes into its own, adding an extra dimension of magic as projected images of the countryside flash by and bring the flying effects to life. A number of technical issues on the night spoilt an otherwise slick show, with the safety curtain coming down part way through act one to allow the team to fix an issue backstage. The scene towards the end in which The Child Catcher is captured by the children and suspended from the ceiling also failed to take off. As with the original production, the show also suffers from unnecessary padding at times, with Lovely, Lonely Man and The Bombie Samba, adding little to the narrative and increasing the already lengthy running time. That said, this fun-filled musical production still has the power to transport you back to your childhood and boasts enough thrills, chills and spills to keep audiences of all ages entertained. CHITTY CHITTY BANG BANG runs at The Lowry until 15 January 2017.